1. What states do you ship to? Plants For Profits currently services fundraisers in Arkansas, Oklahoma, Louisiana, North Texas, Eastern Kansas, Western Tennessee, Alabama, Mississippi and Missouri. If your fundraiser is located in another state, please contact us for more information. 2. How do you determine the recommended sales price per item? 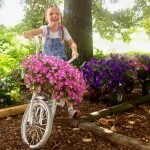 The recommended sales price for each of our fundraiser items is competitive with local garden centers. Our goal is to help your organization make a fair amount of profit with a superior product. Some of our Fundraiser Partners increase the recommended sales price based on their marketplace or other factors. 3. How do the plants ship? Plant material needs to be protected during shipping. Spring combo pots are sleeved with clear plastic and loaded onto rolling racks for transportation in our delivery trucks. Our holiday poinsettias are also sleeved for protection, but we use a fiber material for them that allow the plants to breathe. The poinsettias are then placed in tough cardboard cases to ensure that they arrive healthy and ready to deliver. These cases contain eight #6 holiday poinsettias and measure approximately 14-16″ tall by 13-15″ wide. 4. Do you have an extra delivery charge? No! Parks Brothers Farm has taken the guesswork out of live plant fundraisers by making cost and profit simple to calculate. 5. What is our cost per unit? The minimum for our regular delivery zone is 3 racks, or 96 #12 Fall Mums. Holiday Poinsettias for our regular delivery zone is 25 cases, or 200 pots. Please contact our Fundraiser Sales Team to determine minimums for areas outside our regular delivery zone. Some minimums can be higher. 7. How does color preference work? We do our best to supply Fundraiser Partners with specified colors. That said, we ask that you remember our products are live plants that are subject to various environmental conditions. These variables can sometimes affect the availability of certain colors or the entire crop. 8. When are the order deadlines? 9. When will I receive my plants? Our Transportation Director is one of the most important employees at the farm and is excellent at making fundraiser delivery date requests a reality! We invite our Fundraiser Partners to give us a specific date to shoot for. Sometimes, we have to push a day or two due to short truck volume. We always want to send a truck away from the farm with a full load. It gets very expensive to ship air! Please bear with us if we are unable to get your product to you on exactly the date you specify. We pledge to let you know the moment we find out about a delay. 10. Why can’t you deliver to my house? The streets in most residential neighborhoods are simply too narrow to negotiate with an eighteen-wheeler. The potential for accidents is raised exponentially when our drivers are forced to maneuver through smaller spaces. Thank you in advance for selecting a location that works for our transport vehicles such as a school or office parking lot or a business on a main roadway. This helps ensure your safety and the safety of our drivers. 11. How do I care for my plants once I’ve received them? Hopefully, your plants will go to their new homes quickly after delivery! Parks Brothers Farm has created downloadable documents for home printing and sales team distribution that addresses plant care. It’s a great idea to give a care document to your customers so they can enjoy their plants as long as possible. Our list of helpful documents is located in the left column in the Documents menu. Spring Combo Pots and Fall Mum care is very simple because in our region, during these seasons, you generally don’t have to worry about freezing. Of course, common sense tells us to water spring plants and fall mums daily. Poinsettia care is also easy, and there are only a few steps to remember when caring for these plants. When you receive your poinsettias you need to unbox them and unsleeve them so they can breathe. Check the soil. If the soil is dry you need to water them. If the soil is moist, they can be left alone for the time being. It’s very important not to over water a holiday poinsettia. Also, if it is necessary to store the poinsettias in a facility over the weekend, make sure the temperature doesn’t go below 68 degrees. Interestingly enough, Holiday Poinsettias are native to Mexico and don’t like the cold! 12. Why do you promote straight red Holiday Poinsettia Fundraisers? In a word, simplicity. Red Holiday Poinsettias are the most common holiday plant in North America and customers always want them. Offering only red poinsettias eliminates potential sales team errors and greatly simplifies distribution on delivery day. However, we are happy to provide any size and color combination you request. It’s your fundraiser and you know your customers better than we do! 13. How long will my plants last? Fall Mums last 4-6 weeks and are a great plant to use to fill the gap between spring and winter! Holiday Poinsettias are not only for the Christmas season and will last all year if properly cared for! Please visit our Poinsettia Fundraiser Forms page and download “A Holiday Guide to the Poinsettia” to find out how. 14. What factors affect our fundraiser’s success? There are many variables than can affect the profitability of a fundraiser. Location, saturation of similar product in the marketplace, price, etc. Our most successful Fundraiser Partners have a designated person in charge and a driven sales team with specific goals set for them. For example, if you want to earn $2,000 with your fundraiser you need to know how many units each member of your sales team has to sell to achieve that goal. Daily communication with the team leader is also essential. 15. Our holiday fundraiser went great! Do you have a Year Around Fundraiser Program? Absolutely! Fundraiser Partners who participate in our Year Around Program will receive a customized proposal from our sales team, which is helpful in identifying annual profit potential. Our proposals also serve as a hard copy document for distribution to board members or primary decision makers within your organization. Please don’t hesitate to contact Parks Brothers Farm to request a quote for a Year Around Fundraiser Proposal. You’ll be thrilled to see how much profit your group can make with year around live plant fundraisers! 16. How do I order? You can submit a Get Quote request or Contact Us here on the website or just give us a call at 1-800-334-5770. 17. How long does it take to get a plant fundraiser going? Once you’ve made the decision to start a live plant fundraiser, call us at 800-334-5770 and ask for the Sales Department. We can have your live plant fundraiser up and running the day you order! 18. Where would I find testimonials on your website? Just click on the Testimonials button to see comments from organizations just like yours! Parks Brothers Farm invites you to select one of the available fundraiser programs at www.plantsforprofits.com and start making money today!